Hurry! Place An Order Before Our Prices Rise! Time is running out on our special promotion! Here at Great Grass, we’re having a price increase on the 14th February- which is Valentine’s Day, in case you’ve forgotten. Our artificial grasses are some of the best surfaces in the UK, and that’s why we’re able to work with some of the biggest companies around. We are the largest artificial grass suppliers in the UK, providing the public, as well as businesses and schools, with good-looking artificial lawns and greens. Our grass is some of the most natural, bright, long-lasting grass the UK has to offer. Therefore, we believe our products really are unique to our brand, and this means you really are missing a trick if you don’t snag yourself a bargain while our prices are much lower! But don’t worry- we still have some great deals happening before the 14th, so hurry up and get ordering before it’s too late! No Mud, No Mess, No Mowing! Our artificial grass is the best purchase you’ll ever make for your garden: it looks beautiful all year round, doesn’t need feeding or watering, and it never dies! There’s also no hay fever or harmful pesticides, which are a common issue that come part and parcel of the natural stuff. Our grass is available in different widths and lengths, as well as varying colours and applications. Put your artificial grass anywhere, whether it’s as a replacement for your lawn or to include in a commercial exhibition, the side of your house, or across your walk path! Artificial grass is a no-brainer, since our grass has a 10-year guarantee! There are many reasons why our grass is worth the buy, so remember to get your hands on some patches before the price goes up! So what are you waiting for? Get in contact with us now and order some extra grass to stock up on. If you are a new customer order your free sample today if you want a tester before purchasing. 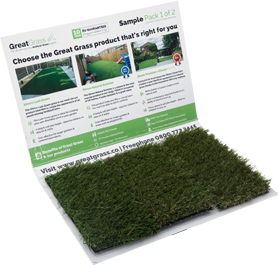 We’d love to hear about your artificial grass needs, so please get in touch!